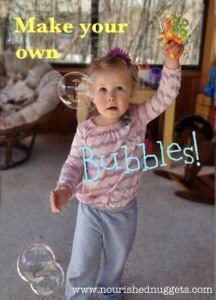 My kids would play with bubbles ALL DAY if they could, but the bubble solutions tends to run out fast. In a pinch I made up my own batch and it worked great! Make your own bubbles! Mix well and have fun! We have this awesome automatic bubble blower. Hands free, so it frees up some time for me while keeping the kids happy with a steady stream of bubbles coming out. Win, win! Get one HERE.